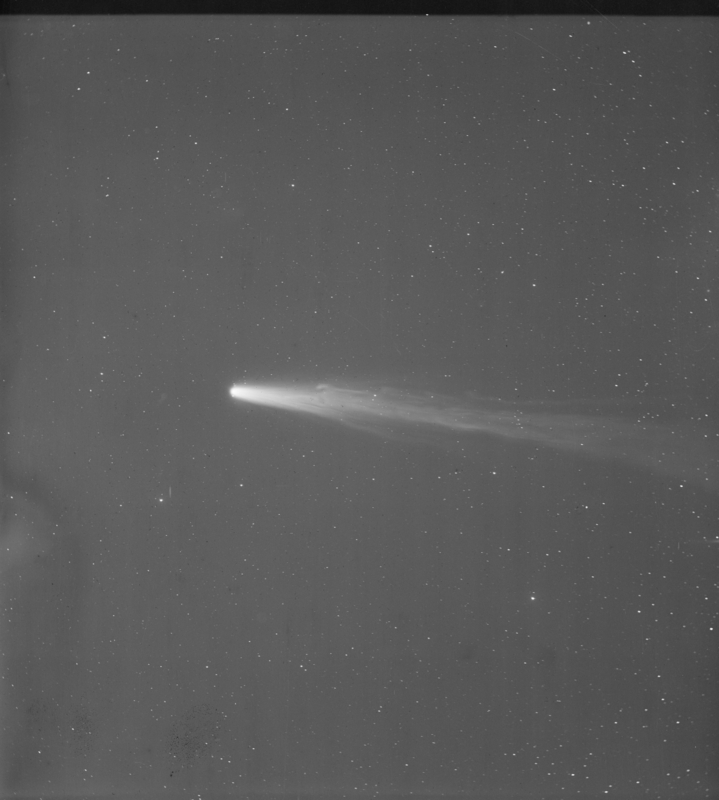 Portion of Plate b41215 of Halley's comet taken on April 21, 1910 from Arequipa, Peru with the 8-inch Bache Doublet, Voigtlander. The exposure was 30 minutes centered on 23h41m29s R.A. and +07d21m09s Declination. 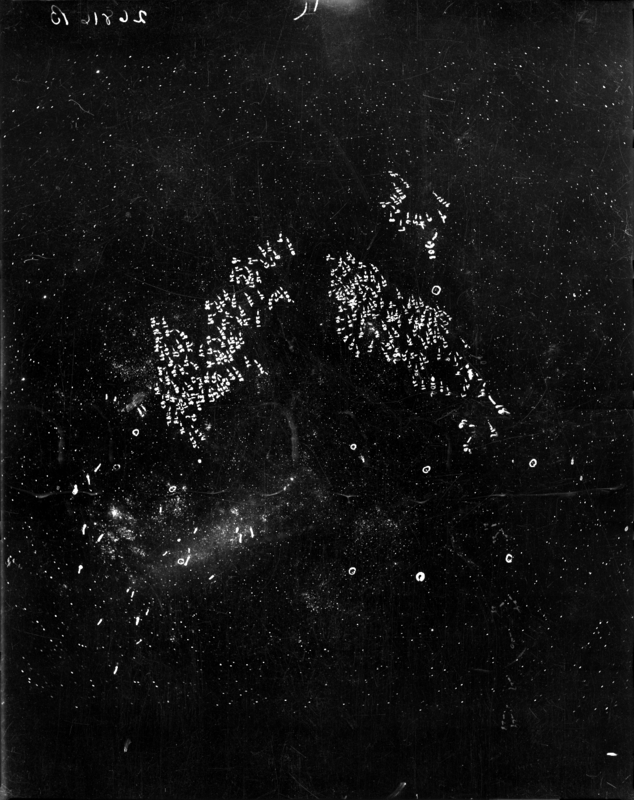 Plate a27014 of Large Magellanic Cloud taken on October 27, 1949 from Bloemfontein, South Africa, with the 24 inch Bruce Doublet. The exposure was 60 minutes centered on 5h25m23s R.A. and -68d55m01s Declination. 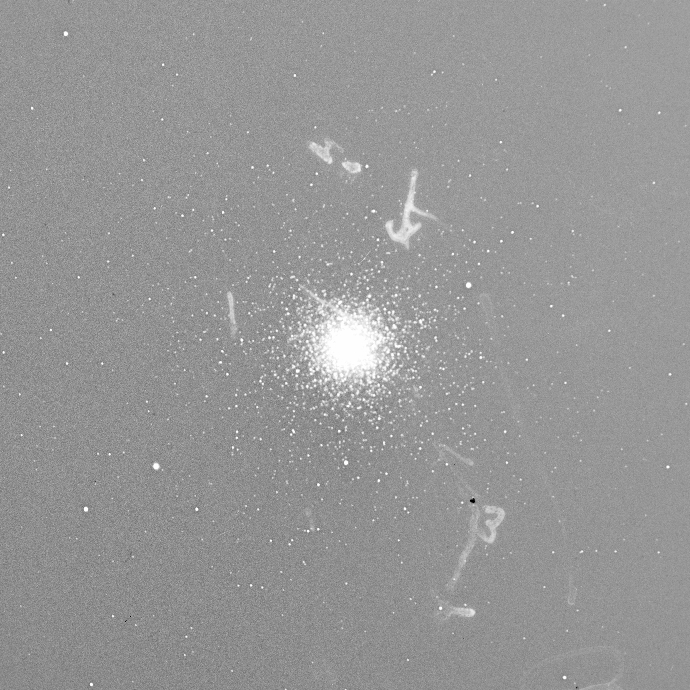 Plate b26816 of Large Magellanic Cloud taken on December 18, 1900 from Arequipa, Peru, with the 8 inch Bache Doublet, Voigtlander, reworked by Clark. The exposure was 60 minutes centered on 5h09m47s R.A. and -67d22m51s Declination. We have not removed the annotations made on the back of the plate because this plate is referenced in the Henrietta Leavitt logbooks made during her research on Cepheid stars. 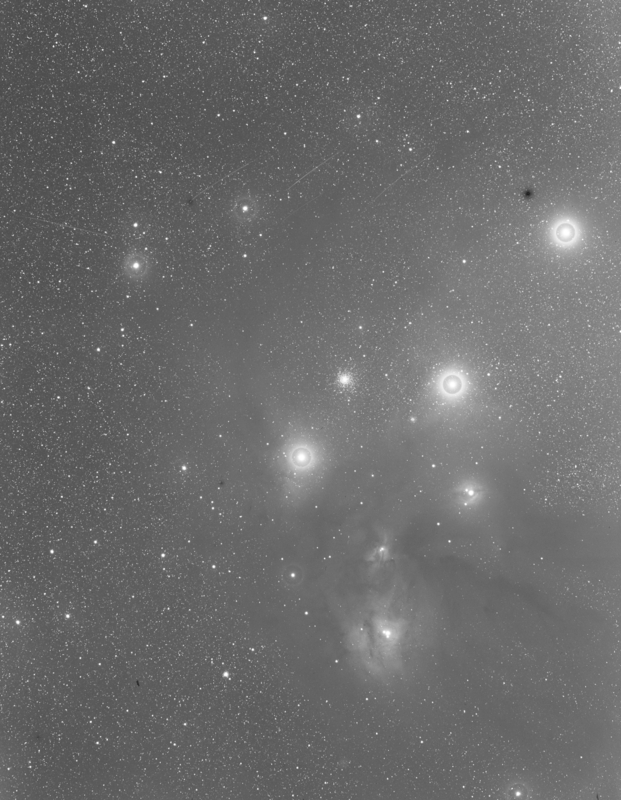 Portion of Plate mf37250 of Rho Ophiucus taken on May 30, 1948 from Bloemfontein with the 10-inch Metcalf Triplet. The exposure was 45 minutes centered on 16h26m07s R.A. and -26d19m43s Declination. Portion of Plate b2312 showing the collection's first image of the Horsehead Nebula. Taken on February 7, 1888 from Cambridge with the 8-inch Bache Doublet, Voigtlander, reworked by Clark. The exposure was 90 minutes centered on 5h55m33s R.A. and -4d57m06s Declination. Single scanner tile (not colormap reversed) of Plate mc24889 showing what is variously known as minor planet 134340, the first dwarf planet, or planet Pluto. 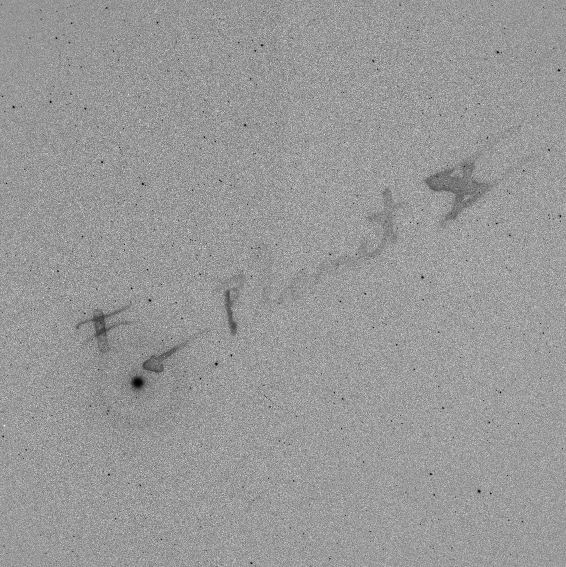 Taken on April 23, 1930 from Cambridge with the 16-inch Metcalf Doublet after Clyde Tombaugh's discovery of the object on February 18, 1930. Pre-discovery images may also be found in the Harvard collection. The exposure was 92 minutes with the plate centered on 7h20m36s R.A. and +21d41m08s Declination. 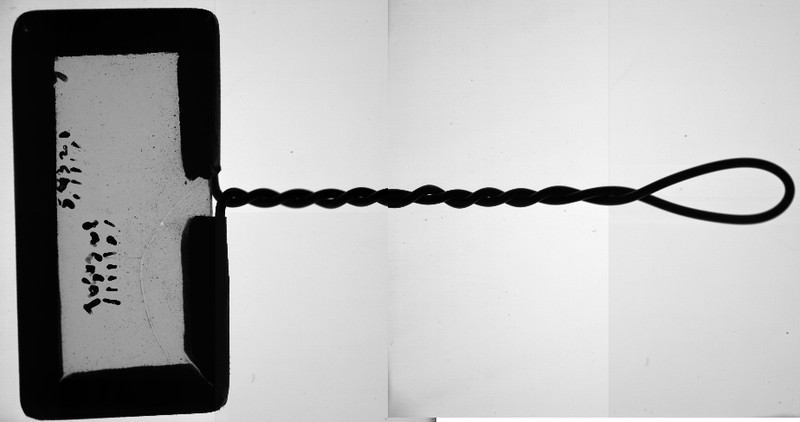 The Fly Spanker contains calibrated star images for magnitude estimation. The size of the head is 4.1 cm x 2.1 cm and the overall length of the head and handle is 7.9 cm. This device got its name because it was too small to be a fly swatter. 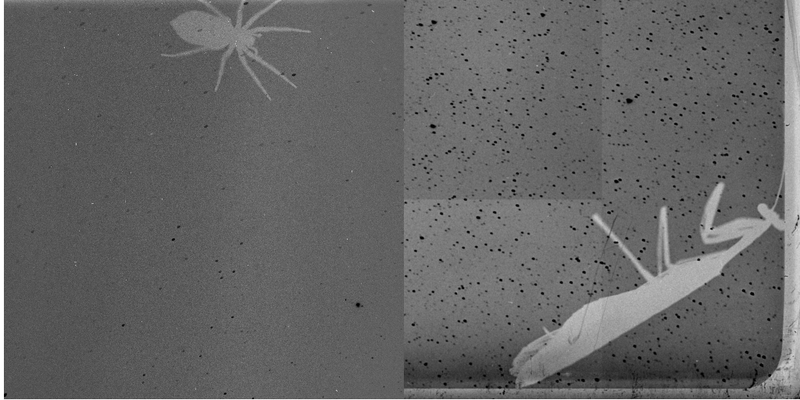 On the left is a single scanner (negative) tile of Plate b16502 of an unwelcomed visitor taken on June 28, 1896 from Arequipa, Peru with the 8-inch Bache Doublet, Voigtlander. 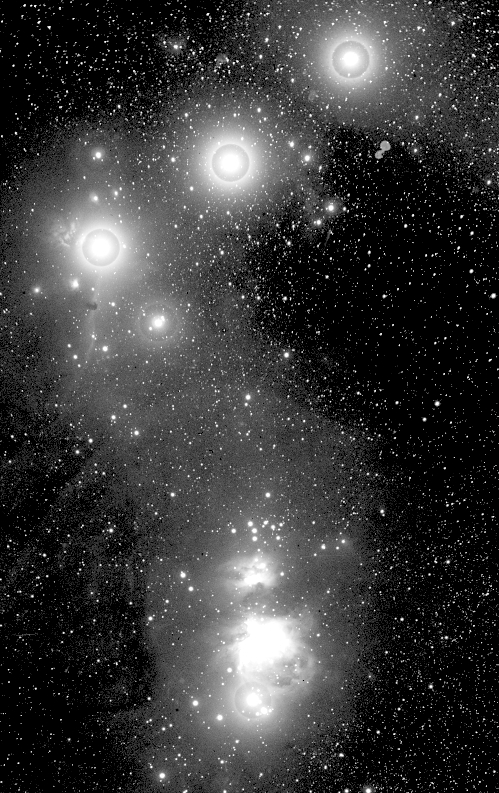 On the right is a (positive) image from plate mf20127 taken at Bloemfontein with a 45 minute exposure on January 10, 1925 with the 10 inch Metcalf Triplet. The spider measures 9.6 mm from head to tail. The Praying Mantis, however, measures only 34.5 mm and is small by North American standards. Some quick research by Alison Doane suggests it may be a Miomantis caffra which are 32-60 mm long. Part of Plate ax02501 of a fireball over Bloemfontein South Africa around 17:13 on June 14, 1928. Taken with a 90 minute exposure using the 3 inch Ross-Tessar lens. This 6.4 MB image shows the full resolution of the scanner. The asteriod Sirona, minor planet 116, is visible at approximately mag 11.8 in the constallation Virgo on plates ac42225 through ac42229 taken with the 1.5 inch Cooke Lens on March 27-28 1952 with exposures ranging from 63 to 78 minutes. 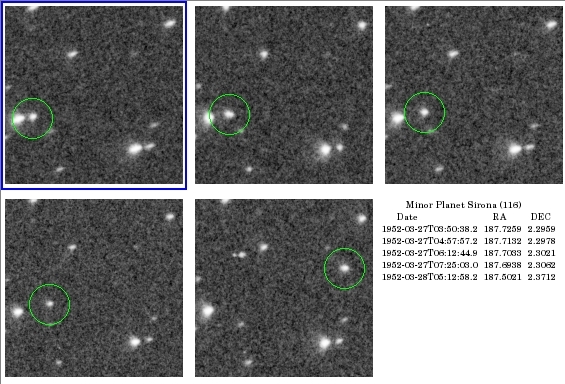 Thanks to Brian Marsden of the Minor Planets Center for identifying this asteroid. Discovery plate of the first known spectroscopic binary, Zeta Ursa Majoris (better known as Mizar). Top: plate C 447 taken Mar 29, 1887, Bottom: plate C 441 taken Apr 5, 1887. E.C. Pickering noted that the K line of Ca+ was double on C427, but single on C441. Eventually, he concluded that Zeta Ursae Majoris is a binary system. 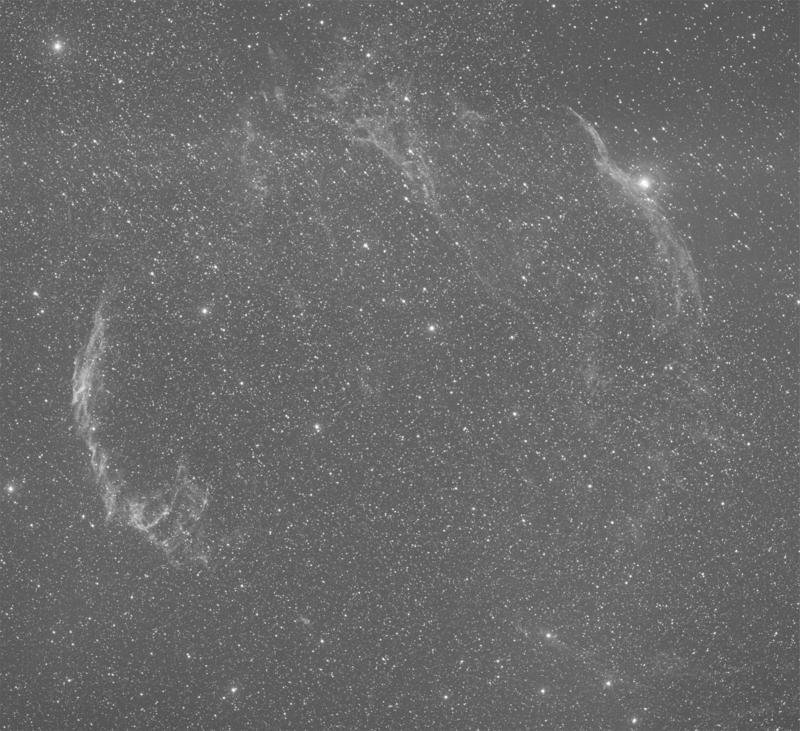 The Veil Nebula in Cygnus on plate J01160 photographed with the 24-33 inch Jewett Schmidt telescope at Oak Ridge on October 22, 1946. North is in the direction of the upper left corner of the image, which is centered at 20h51m RA and 30d53s declination in the constellation Cygnus. The width of the nebula is 2.5 degrees. 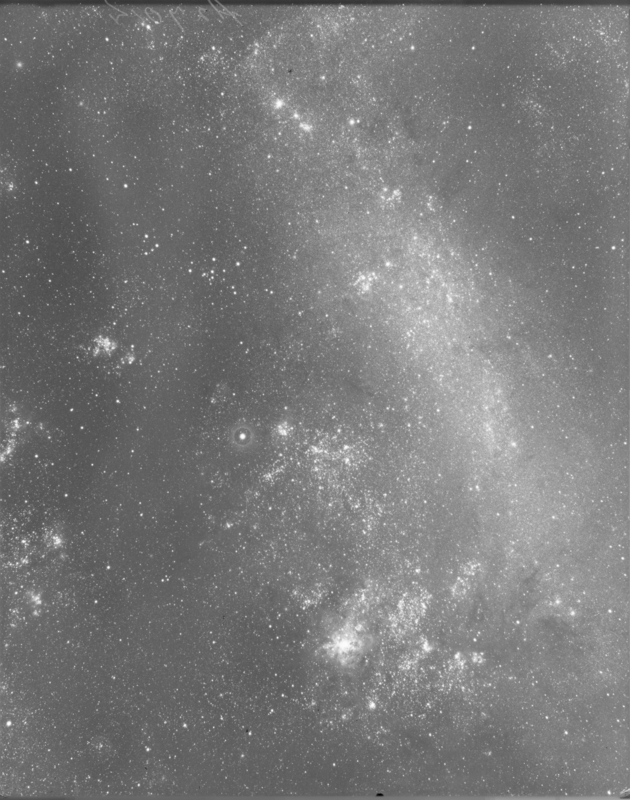 The full size mosaic has been binned 4:1 to produce this image.